The X-2 sits after a rough landing with a collapsed nose landing gear. 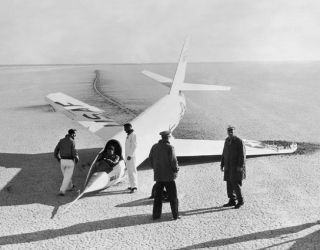 In this historical photo from the U.S. space agency, this 1952 photograph shows the X-2 #2 with a collapsed nose landing gear after landing on the first glide flight at Edwards Air Force Base. The aircraft pitched at landing, slid along its main skid and contacted the ground with the right wingtip bumper skid causing it to break off. The nose wheel had collapsed upon contacting the ground.